Well, shortly after my last blog some stuff happened that was completely unexpected. I tore my right bicep distal tendon (elbow) completely from the bone. Had surgery 2 weeks ago and it was unsuccessful. The doc said that the tendon was too shredded and short to be reattached. Called up the office of Dr. James Andrews, who’s worked on Bo Jackson, Roger Clemens, etc., and they wouldn’t see me because I was fresh out of surgery. Cadaver tendon isn’t an option due to the stresses that tendon gets plus the body would probably reject it.. so I’m stuck without the large head of the bicep. This Thursday I meet with the doc to see what I should do about getting the other head up to par strength wise. As of now, it’s predicted I’ll lose about 30-40% strength. That being said, there’s been nothing really done on the cars. I did mess with the mustang a little prior to the injury. The dash and heater core are all out. Once all that wiring is yanked out I’ll finish up the floors. It’s kinda nice having more room to work. It’s been a while since my last update. My mom and bro came down over labor day weekend. We got the old engine out of the Mustang and a few things done on the focus. About a week or so later I ended up buying a new tool box so that Mike can have his old top box back. I’ll end up using the bottom box as a welding cart. Should make it easier to move around with the AHP. Over this past weekend I bought some ramps and a few things needed to change the oil in the truck. The ramps from O’Reilly’s are great and highly recommended. They are some type of plastic material but it held the truck great. They do tend to slide so definitely kick them up under the tire pretty well before ya go up on em. Yesterday I decided to start eliminating engine bay wiring. 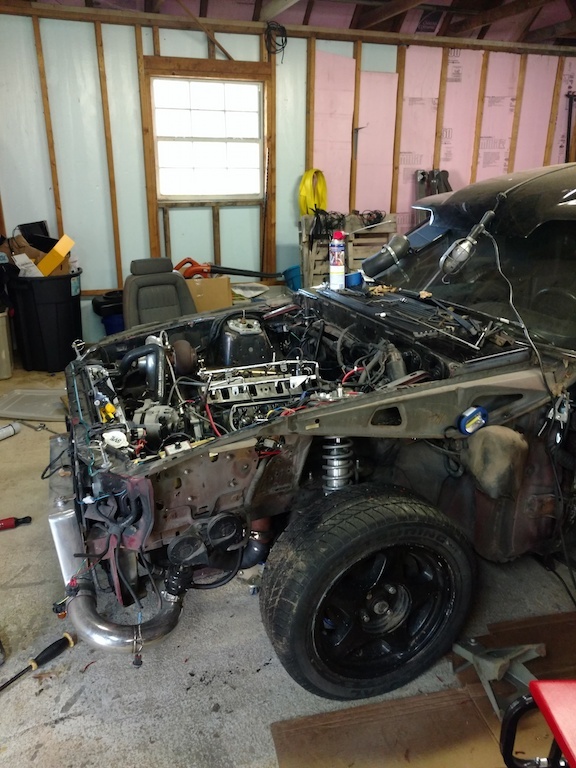 I took out the MSD 7AL-2, the extra wiring for that, the headlight harness, starter wiring, solenoid, coil, airbag sensors, etc. There is still a bunch to do but I’ll have to get the transmission out before I can do the rest. Once all of that is done I’ll start cleaning up the holes in the engine bay and inner fenders. Also, I decided that I’m going to go with Haltech for engine management. I like the MSPNP a lot but there’s no point in using the nearly 30 year old wiring harness. The Haltech will come with everything I need and will offer all the support options I’ll probably ever need. Once funds are freed up I’ll get all that going. So, the fofo is about done. Just needs the following: 1) Finish installing support bearing (need a nut) and oil pan, 2) install SVT header and flex pipe, 3) get the radiator & lower support put in correctly, 4) go back over everything and tighten bolts/nuts, 5) get/install new sway bar endlinks. Since the weather is getting cooler I should have plenty of opportunities to finish it up without dying from the heat. Soo, that’s it for now. Well, I ended up getting a few things done. My brother has decided to come down to pick up some parts. 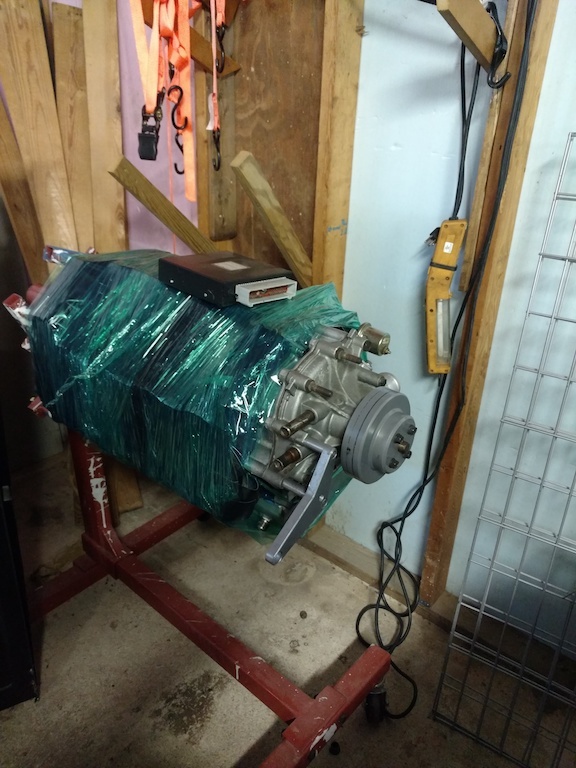 Knowing that I’ll have to use the same cam (short block I bought has a solid roller and my heads are setup for hydraulic roller), I figured I’d get ready to pull the engine so we can get the cam out. 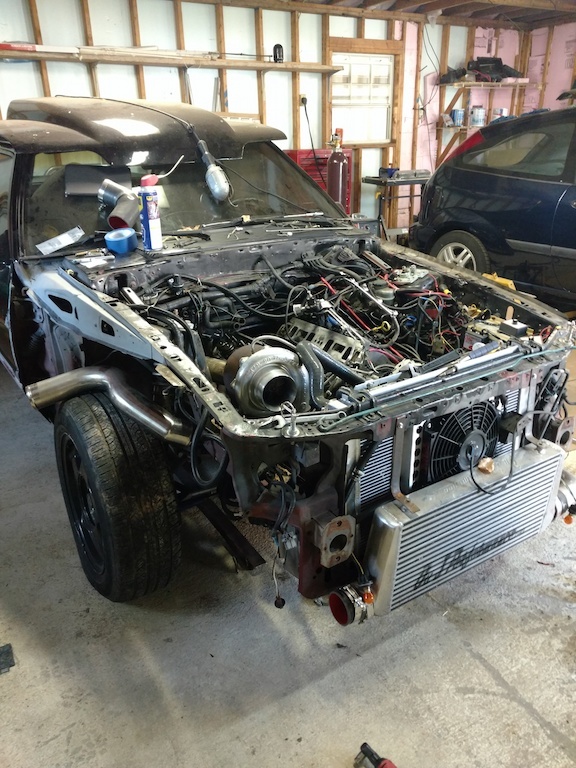 Took off the fiberglass front end and upper intake (and throttle body) on Wednesday. Today I tackled taking off the rest of the stuff. 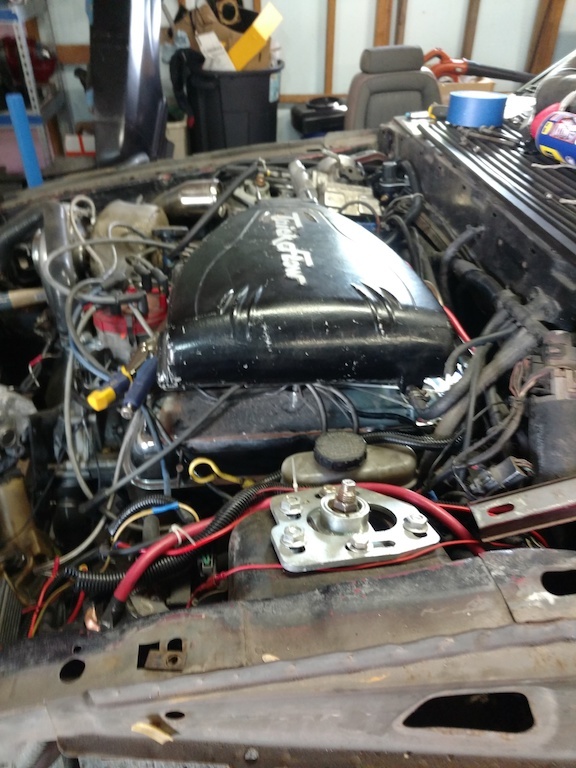 As you can see in the pictures below, I removed the lower intake, rockers, lifters, and pushrods. When I removed the lower intake there were 2 bolts on the passenger side that were pretty damn loose. I’m sure I was losing some boost pressure there. After we get that engine out I get to start the fun. 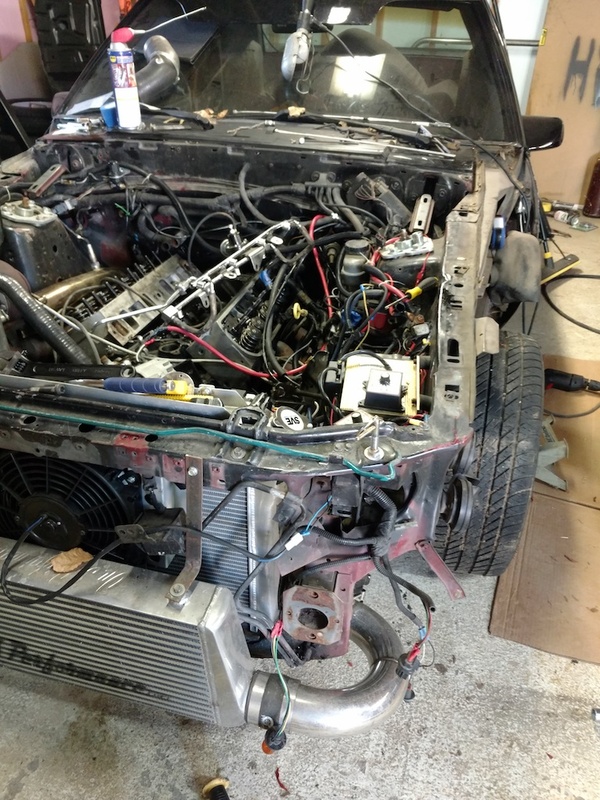 I plan to have a mostly shaved engine bay and to redo a lot of the wiring/routing of wires. I’m sick of having something that doesn’t look clean at all – see first pic. We did it that way to get it to the track and now it’s time to do it “right”. The last picture is the new short block. I’ll get some pics of the mocked up setup once the old engine is gone and I can get some dowel pins for the heads. While the engine is out I’ll also check out a few things with the transmission and try to move the dipstick a little bit. That thing presses right up against the valve covers so it HAS to be transferring heat from the downpipe. The downpipe also touches the valve covers. That’ll be fixed as well. Anyway, enjoy the pics. Also, send me a text or email letting me know there is someone actually reading. If no one does, I’ll just keep move this to a computer in the house so I don’t have to pay for hosting anymore.